Since its launch in December 2008, the first edition of CSA Z462-08 Workplace Electrical Safety has had a significant impact on the electrical industry. Next to the Canadian Electrical Code, it has become the best-selling CSA standard. This January, CSA has published the second edition of CSA Z462. What changes are included in the 2012 edition? The first edition requires worker retraining at intervals sufficient to maintain an appropriate level of awareness, or more frequently if evidence indicates otherwise. The 2012 edition specifies that retraining intervals must not exceed three years. It is hoped that this will ensure employee training remains current with the changes that occur every three years in Z462. The electrical safety-related work practices in the first edition of CSA Z462 primarily address electrical equipment that operates on alternating current (AC), and not direct current (DC). This gap has been addressed with both new and added requirements specific to DC. A new shock protection boundary table and an arc flash energy calculation method for DC equipment have been added. For decades the terms “flame resistant” (FR) and “arc rated” have been used interchangeably when referring to arc flash personal protective equipment (PPE). While all arc rated PPE is flame resistant, not all FR material is or can be arc rated. To address this potentially fatal confusion between FR PPE and arc rated PPE, the new edition of Z462 consistently uses the term “arc rated” when referring to arc flash PPE. Most employers currently attempt to use the Hazard/Risk Category PPE Table to assign arc flash PPE. However, this approach is problematic as the Hazard/Risk Category PPE table was not designed for that purpose. A table has been added to assist employers to select arc flash PPE based on potential arc flash energy exposure. The first edition of the standard frequently refers to hazard/risk as though the terms were synonymous, whereas in the OHS world hazard is a source of harm and risk is the combination of the likelihood that harm can result and the severity of that harm. Hazards are identified and risk is assessed. With the exception of the Hazard/Risk Category Method, in the second edition of Z462 the use of these terms will align internationally accepted standards on risk management. Annex F, Hazard Identification and Risk Assessment, has been completely rewritten and is a good introduction to electrical hazard identification and risk assessment. All too often, electrical safety is left to the electrical professionals such as engineers and electricians. OHS professionals need to become involved in and bring their wealth of hazard identification and risk management knowledge to electrical safety. The 2012 edition of CSA Z462 is a good place to start. London Hydro is the gold winner in the Utilities and Electrical category for the 2014 Canada''s Safest Employers Awards. 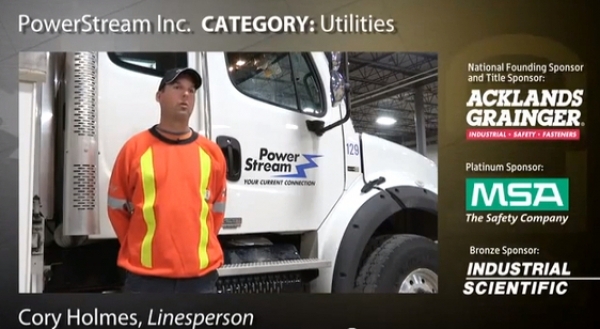 PowerStream is the gold winner in the utilities category for the 2013 Canada''s Safest Employers Awards.